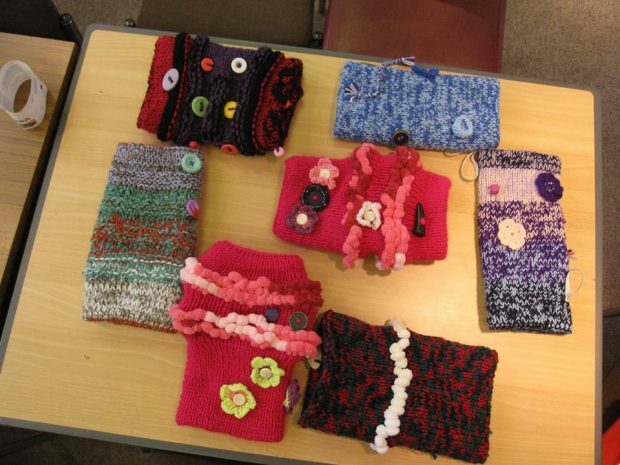 Twiddlemuffs are a knitted hand muff with interesting bits and bobs attached inside and out. They have been designed and developed to provide simple stimulation for active hands, while promoting increased flexibility and brain stimulation. Many patients with dementia have found the Twiddlemuff reassuring and comforting. The staff introduced the idea to the Library Knit and Natter Group who took it on board with enthusiasm. 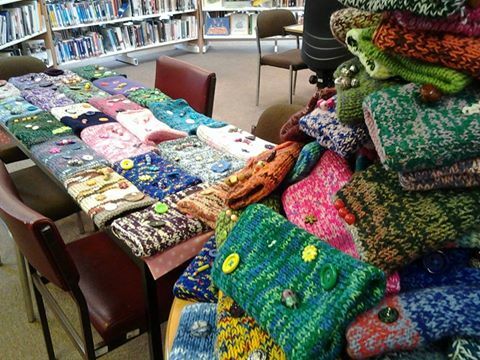 Over the past 12 months they have made over 250 Twiddlemuffs. Most of these have been handed over to Angela Barton (Heart of England NHS) support work on the dementia ward at Solihull Hospital. 30 Twiddlemuffs have also been sent to a local nursery. A mother visiting the library was given one for her autistic child to use when stressed. When he used it at nursery, it was seen by nursery staff. They thought they were such a good idea they requested them for all of the children in the group. The benefits do not end with the recipients of the Twiddlemuffs. The knitting of them has given much pleasure to the group making them. 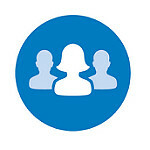 They have come together to meet socially and produce something for others, giving them a sense of achievement and value. This means so much to people who, without the group, would feel socially isolated. This example of one part of the community coming forward to do something for the benefit of others illustrates the important role of libraries in supporting community engagement. And Olton Library exemplifies community engagement at its best. Is this the level to which public libraries and the libraries 'Task Force' have descended ? That's a very unpleasant attitude. This is a fantastic thing. Libraries are an important community resource for everyone. They are the last public space where you are a person not how much you spend. Well done to Olton Library for being such a shining example of community spirit. 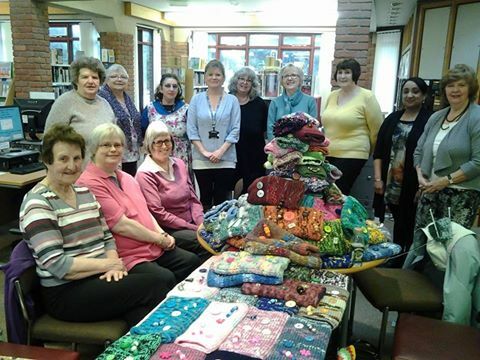 As a member of the Knit and Natter Group at Olton Library, I can confirm that we, as a Group, have been delighted to be able to pass on the multiple items we have made to the various recipients. Solihull Hospital have been enthusiastic with our efforts, as have the Neonatal Dept of local hospitals for our hats, jackets, etc.. We have recently been able to supply a number of scarves and fingerless mittens to Social Services for distribution to local homeless. This Group has been a benefit to ourselves as well, providing a sociable get-together in a place we feel comfortable and safe.